There was a time when AUTOart did not charge silly money for their models, and still created outstanding products. For about USD$50, you could get yourself a high-quality model that leaves Maistos and Bburagos in the dust. 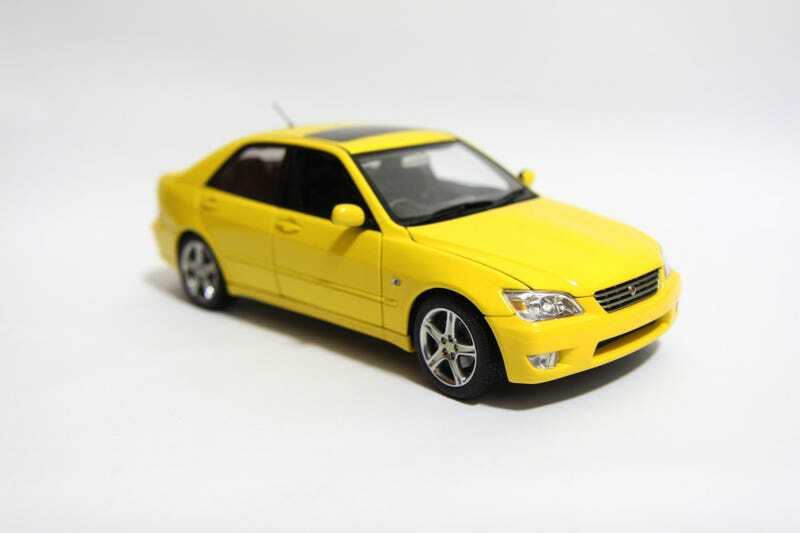 But now, even the most basic of 1/18 scale models from this manufacturer are in the mid USD$100s. Here is one fine example of "old school" AUTOart that you can buy 2nd hand for a steal - the Toyota Altezza. This car was designed to compete with the entry-level luxury sedans from Deutschland, like the BMW 3 Series and Mercedes-Benz C-Class. While it may not have been a hit with brand snobs who only swear by the Germans, the Altezza shone in the performance and reliability sector. The RS200 variant (JDM model) came with a punchy 209 horsepower 3S-GE BEAMS inline-4 engine, tuned in partnership with Yamaha. It also came with a 6-speed manual transmission and RWD, making it a proper enthusiast's car. This model seems to get most of the details right at first. I particularly like the main grille, which is perforated. The horizontal metal bars are extremely lifelike. Ditto to the ruby red Altezza badge at the centre. Paint is even all around, with no visible signs of under/overspray anywhere. However, from here onwards, the model starts to show its age. The lower grille, for instance, is not perforated, and the mounting posts on the foglights can be seen. And I would have preferred the headlights to be slightly darker, like its 1/1 counterpart. Moving to the side, we can see the car even more clearly. Again, mounting posts can be seen on the clear signal indicators. The panel gaps are not as tight as modern AUTOarts, but we do get to open all four doors. More on that later. The tyres are marked "Goodyear Eagle GS-D", which is a pleasant surprise. The wheels, too, deserve credit. They are highly polished metal, but not quite chrome. The end result is a beautiful set of realistic wheels. There are even Altezza photo-etched badges at the centre on all four. The brake discs are grooved, but not so convincing. However, the calipers are above average. At the back, we are greeted by the infamous Altezza tail lights - clear with red bulbs. While it may be an eye sore on many "ricer" cars that don these lights, the ones on the Altezza look quite alright. After all, they were designed for it. The ones on this model, too, are well-replicated. Same goes for the small round circular lights on the bootlid. The chrome exhaust pipe does not come across as fake-looking at all. There is a photo-etched Altezza badge on the top right. The end result is a clean and fuss-free rear end. Kudos to the design team on this model. The bootlid can be opened, but to a limited angle, which I found quite unfortunate. The space inside is carpeted, from the main boot to the lining above it. Opening the driver's door, we are greeted by a load of details. This being an older release, the interior seems outdated with the overwhelming amount of plastic parts. The grey on black trim looks a bit mismatched and cheapens the look on the whole. The chronograph-style instrument panel too is not realistic and cool enough, as it should be. However, it is the small details that help to redeem the model slightly. For instance, the aluminium pedals are convincing, and the centre dash is filled with details. All the buttons are labelled properly. We can even see the audio system and individual dials. The aluminium gear knob is also a nice touch. All four doors open, as mentioned earlier on. The interior is fully carpeted, which is nice. Only the rear doors' windows are up, leaving the interior exposed to dust coming in from the front. There is a sunroof on the roof, which has a light orange tint. The bonnet can be opened as well to reveal the 3S-GE BEAMS engine. This performance-oriented motor is far more powerful than the 2-litre inline-6 engine that is inside international market variants of the IS200. This scaled version is fairly realistic, and seems to be a full engine block. However, the plastic wirings are obvious and somewhat Maisto-grade. Turning the car upside down, the exhaust system can be seen clearly, whereas the other small details are in a sea of dreary black. I really love this model. It may be old, lightweight, and riddled with paint issues (from its previous owner), but it does have character that makes it far too precious to throw away. And it is highly detailed, even by today's standards. You can find this model for decent money today, and I do recommend buying it.